February’s profiled personality is an individual who came from humble beginnings; from the neighborhoods of Paper Alley/Usher Street in Belize City to the halls of City Council in London, Ontario, Canada. He is intelligent and from childhood had a drive to succeed and make a difference in the lives of others. He has a passion for equity and fairness, and has used that to fight for his constituents in Canada. He is a Prostate Cancer survivor, and has used that platform to educate and add to the understanding of the disease. He is an Engineer, an author and a motivational speaker as well. He has received countless awards and belongs to several organizations, making a difference in the lives of many. It is fitting that he is profiled for February, the observance of Black History month in the United States and Canada, because he is the first and only Belizean, Caribbean and individual from the African Diaspora, to be elected to the City Council of London, Ontario in Canada. This month’s profiled personality is Mr. Harold Lindsay Hughbert Usher, known by some in Belize as Harry Usher. Many who know Harold, know him as the city councilor, or the motivational speaker, or even the author who wrote the book “Prostate! Prostate! Prostate! A Problem of Men,” to help men deal with diseases of the prostate, including prostate cancer, but few know “Harry” the young man who grew up in Belize City , who, as a kid, woke up at 4:30 am every morning to go door to door, selling hot johnny cakes, which his mother baked. Harry was born in Stann Creek (currently Dangriga) of Belize. His parents Violet McKesey and John (Jack) Usher were told that their new born baby son would not live to see his first birthday because he was born three months premature and weighed only 3 lbs and 6 oz. His mother nurtured him and gave him all the necessary sustenance to survive, grew up and excelled. He was still a baby when his mother moved from Stann Creek to Belize City, so he spent all his formative years in the city, but still goes back to Stann Creek every time he goes home to Belize. Life in Belize was the best for him. Growing up he always had lots of friends and an entrepreneurial mindset. Besides selling his johnny cakes every morning, he owned a four-wheel push cart that he would take to the Belize market early mornings and people would pay him to cart their purchases from the market or court house wharf to their houses. He was a small person and many times had difficulty pulling the cart up and over the swing bridge. But he didn’t give up. Each morning he struggled and was determined and so overcame all obstacles that came his way. Harry used to set up a stand on his cart on Saturday mornings, at the corner of Pickstock Street and New Road to carry out his entrepreneurial activities. He would also buy young chickens, fatten them up with coconut trash, plantain skins and corn and sold them at a profit as grown hens. He also remembers buying green plantains cheap, and later sold them for a profit after they became ripened. He even sold white firewood by the bundle, as well as many other items from his cart stand. He used to purchase raw squash seed (pepitos) by the quart and patch them and sell them at Matinees or Football games by the match box full. Remember him? Harry attended St. Mary’s Primary School in Belize City. When he graduated from Standard VI he was the only student from the school to be offered two scholarships, one to St. Michael’s College and the other to the newly established Technical High School. He had dedicated and applied himself in primary school, but he had teachers like Mrs. Maureen Hinkson, Miss Young and Miss. Reyes each of who influenced him to work hard and do his best. But the teacher who had the most profound impact on him was Miss. Crystal Slusher. Harry remembers Miss Crystal as being energetic and enthusiastic about her students. She emotionally invested in them and ensured that they applied themselves to their school work. She made a young Harry believed in himself and gave him the confidence he needed to believe he could do anything. Harold Usher chose to attend Technical High School in Belize City for four years. He was among the first group of students to enter when the School opened its doors for the first time on January 7, 1952. He completed the four-year program in December 1955. The class also took the Cambridge Certificate Examinations. He doesn’t really remember a graduation ceremony taking place, they were told they had completed high school and were sent home. He remembers there were classes for boys and a class for girls at the beginning. Each year, there was a new additional class for boys that started every January, but there were no new classes for girls; not until January 1956, after the first set had completed their high school program. At Technical High School, the teacher that most influenced Harry was Mr. Leslie Dennis. Harry remembers him as being very much approachable and intelligent. Mr. Dennis was from Jamaica, he was away from home, but he poured himself into his work and ensured all his students learned and inspired them for the life that lay ahead. After Technical High School, Harry went to work at Brodies until 1958, when he won a scholarship to study Construction Drafting in Puerto Rico for one year. He returned home in 1959 and since he wanted to become a Minister, taught at Wesley Primary School for one year. He was not satisfied with the speed of achievement Belize offered him in the late fifties. He had a taste of life outside of Belize, and realized that the goal was limitless, but he would need to leave Belize. “I wanted to make something of myself, that would allow me and my future family a sustainable good quality of life and to make a contribution to the world around me to make life better for others,” he remarks. He decided to go to Jamaica in 1960 to work and be closer to the Methodist Theological Seminary. He stayed there for 3 ½ years, but did not enter the Ministry, instead finding work as a Draftsman with architectural firms. While working there he was persuaded daily by a Canadian friend to move to Canada. “Harry, I think you should go to Canada,” he would say. After months of badgering, Harry finally decided to inquire into legally migrating to Canada. The entire process from application to acceptance back then took him four months. He vividly recalls the day he arrived in Canada, “I arrived in Toronto at 8:40 pm on July 1, 1963 (Canada’s birthday), and the sun was just setting.” The moment is permanently etched in his memories, for it was a sign of a brand new start for him. Harry went to Canada with a high school education, $300.00 in his pocket, a suitcase of clothes, and big dreams. Canada was the only viable option for him. He didn’t want to go to England, he didn’t have someone to sponsor him to immigrate to the United States, and going back to Belize in 1963 was not an option. He found a job as a Draftsman, within two weeks after arriving in Montreal, Canada. He also recognized and seized the opportunity to attend University at night to upgrade his education. It took him six years on a part-time basis to complete two- years of university courses. Recognizing that time was of the essence, he quit his job, obtained financial assistance and attended University full time. He graduated from Sir George Williams (currently Concordia) University three years later with a Bachelors of Engineering – Civil, Degree. Looking back, Harry said “it took a lot of sacrifice on my and my wife’s part to accomplish that, but we have no regrets.” Obtaining his Civil Engineer degree was his ticket for a better lifestyle for himself and his family. Upon graduation, Harold was hired by Bell Canada, the telecommunications giant, as an Engineer. In 1981 they transferred him to London, Ontario. He continued to work for them until 1996 when he changed his career to Speaking and Training. On October 25, 2010, Harold Usher was re-elected in Municipal Elections in London, Ontario, Canada with 52.4% of the electorate. The victory was his fourth win in local elected politics, he was elated and proud that all his hard work campaigning had paid off. But the win also made him reminisce back to 1994 and why he wanted to enter elected politics to begin with. For him, it had seemed like a natural process, he had volunteered and worked on several community projects, belonged to several committees, organizations, and Boards including the Race Relations Advisory Committee in London, Canada. He sat on several organizations’ Board of Directors, including Toastmasters International, London Multicultural Youths Association, Fanshawe College of Arts and Technology, the Consortium for Belizean Development, and others. All the work he was doing was aimed for the betterment of the citizens and the community. So he thought why not run for elective politics, where he would really have a chance to be effective and most importantly, bring about change. Deciding to enter the political horse race was the easy part, winning was another matter. He tried twice without winning, in 1994 and again in 1997, for his bid to represent Ward 6 for the City Council in London, Ontario. Then the year 2000 came around and he decided to try again, he was determined, for he had something meaningful to offer and he truly believed he could make a difference. He was an advocate for lifelong learning, safe communities, healthy living standards, sustainable social and economic development, human rights, fairness, justice and equity, diversity in the workplace, opportunities for the disenfranchised, housing for the homeless, and support for the financially less fortunate, particularly youths, seniors, jobless, disabled, immigrants and foreign trained professionals whose trainings go unrecognized. He won for the first time in three tries in 2000. He said, with a smile, “I never lost, it was just a three-step process.” His victory not only made him the first, but also the only person of African/Caribbean ancestry to be elected to the London, Ontario City Council. He enjoyed working for and on behalf of his constituents. He works on the premise that “people don’t care how much you know, until they know how much you care.” And he cares. The citizens of London, Ontario approved of the good work Representative Usher was doing and returned him as their representative in 2003 and again in 2006. As the issues became more complex and critical for his constituents, Councilman Usher became more energized and determined to be the representative who tackled difficult issues and got things done. His latest victory in November 2010 was his fourth consecutive. He won the election by a landslide, beating out his five opponents handily, gaining more votes than all theirs combined. During the campaign, Usher stated that besides his ten years representing the people of London, ten years of which he was extremely proud of, there were certain things he still needed to do to make sure that things were in place for his constituency and the citizens of London, Ontario. Representative Usher had unfinished business, he still had more fighting to do for the people of his Ward. He pledged “to continue to ensure, improve and sustain the good quality of life for residents.” As a City Councilor representing his constituents, he continues to advocate for the strong principles he did when he first ran. Today, beside being a City Councilor, Harold sits on several Boards where he makes a great contribution to the community, including Goodwill Industries, EMO Workforce and Development Board, two Toastmasters Clubs Executives, Western Fair Association, Federation of Canadian Municipalities, London Transit Commission, Lake Huron Primary Water Supply Board, Consortium for Belizean Development, and several others. In February 1998, Mr. Usher was diagnosed with prostate cancer. To date, it’s the most difficult news he has ever gotten from a doctor. His emotional state was one of disbelief. He initially went into denial. He explained that having prostate cancer one does not have any symptoms and so it’s difficult for one to believe that it is harmful. But if no action is taken by the diagnosed, the cancer starts eating away toward outside the capsule, and is always on the verge of metastasizing to other parts of the body. It took him about six months to come to grips with the reality of his diagnosis and to start dealing with it. In researching the disease, he was stunned to discover that men, do not really give much thought to their health. For the most part, men are reluctant to go in for a medical check-up, and even more so when it involves a rectal examination. In his research he found that few men understand the prostate, its location and its significant function. Another important fact he uncovered was the importance women play in both the diagnoses and treatment. He put his findings and experiences in a book, which he co-authored with renowned Canadian Urologist Dr. Joseph Chin, entitled “PROSTATE! PROSTATE! PROSTATE! A Problem of men.” Check it out at www.haroldusher.com or write husher@rogers.com. In 1996, he started his own speaking and training business. He created a company called “Adventures in …” SEMINARS & SPEECHES.” He became a public speaker, offering motivational and inspirational speeches to the public. He also delivers human resources development training and speeches for companies, and their employees. This again was a natural process for him. In 1984 he had joined Toastmasters, an international, non-profit educational organization dedicated to honing its members’ skills in public speaking and helping them acquire qualities necessary for good leadership. 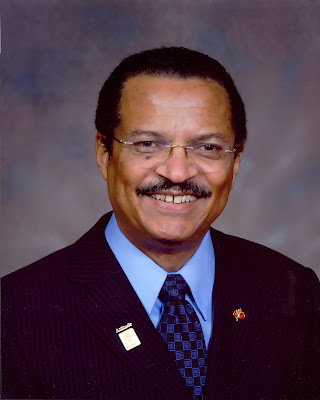 Distinguished Toastmaster Harold Usher has remained a member of the organization to this date and has received many distinguished awards from the organization, including the Presidential Citation in 2000, Leadership Excellence Award (for high performance) in 2006 and the Distinguished Toastmaster honor in 1989, 1996 and again in 2007. He served on their International Board of Directors from 1992 to 1994. Mr. Usher has received countless other awards, too many to mention, but there are a few that are really special to him and stands out. In 1992 he received the Excellence in Teamwork Award from Bell Canada. 1992 was a special year, for he also received Canada 125th Commemorative Medal from the Governor General of Canada. Recently, he received the Joint PEO and OSPE Citizenship Award in 2008 and the London Black Community Achievement Award and African Canadian Achievement Awards in 2009 and 2010 respectively. For the same consecutive years he’s been honored with being selected as the Honorary Chair for the Fathers Day Walk/Run Fundraiser events for Prostate Cancer Research in London Ontario and in 2010 he was invited to Seoul, Korea to witness the launching of Korea as a “Medical Tourism Destination” to treat Prostate Cancer. Mr. Harold Usher is an accomplished individual. He has been deliberate in pursuing his goals and with the help of some individuals who have truly trusted him and allowed him to fly he was able to achieved. In recognition of all those who have helped him, and there are many, to achieve what he has achieved, he has adopted an ATTITUDE of GRATITUDE, principle. He says “Thank You.” Among the many, there are four individuals who have made an outstanding impact on him during the time he needed it most, and it’s with their help that he was able to persevere. Rev. Claude Cadogan, a Belizean Methodist Minister, who persuaded Harry to see that life was full of possibilities and he must be opened, believed in himself and embraced the opportunities that came his way. Mr. Bernard Bloomfield, a Canadian Jewish businessman and philanthropist was another who impacted his life. When Harold decided to attend university full time to complete his engineering degree, it had to be financed and he also had a family to still maintain. Mr. Bloomfield made sure that Harold had access to the necessary finance for schooling and personal use eight months for each of the three years that he attended full time. Dr. Matthew McDouglass, a Trinidadian born Professor, provided the inspiration and mentorship Harold needed to complete his civil engineering degree. He was a professor and Chairman of the Civil Engineering Department at Sir George Williams University. He paved the way for Harold and made sure he entered his third, fourth and fifth years of the program at the university. For Harold’s entire three years at the University, he was a friend who provided guidance and inspiration for Harold to complete his education. The final of the four persons who have had a tremendous impact on Harold’s life was Mr. Jim Hillel, a Jordanian born District Manager for Bell Canada. He took a chance and had faith in the new Civil Engineer and hired Harold immediately after graduating from university. Harold is married to Melba Marie (nee Wright) of Belize. The two were teen-age sweethearts; they first met when they were both attending St. Mary’s Primary School. The couple has been married since September of 1964. They have three daughters, Natalie, Stephanie and Melanie. All three children were born in Montreal. His eldest daughter, Natalie is married with three children. The second, Stephanie is also married with five children, including two sets of twins. Their youngest daughter Melanie is unmarried and has not yet started a family. His family has been a source of strength for him. He has their love and support in all that he does. They have been his inspiration. Mr. Harold Lindsay Hughbert Usher is a Belizean Canadian. He came from humble beginnings and has achieved much success. Throughout his lifetime he has had positive influences that helped him become the person he is today. He has a family whose sacrifice and support gave him the courage to soar. He no longer lives in Belize, but continues to regard Belize as his native country. He loves Belize, and continues to give back and talk it up whenever the opportunity presents itself. He possesses a strong sense of fairness and is motivated to help others; to be the voice of the voiceless. Harold’s Mission in life is to “inspire and empower, individuals to better themselves and achieve a “sustainable good quality of life.” He is a determined individual who overcomes obstacles to achieve his goals. And most importantly, he loves life and believes it’s a precious gift. One of his goals is to meet 1,000,000 people and touch 100,000 lives before he leaves this world. YOU might be one of them. And those, ladies and gentlemen, make him the SENSATIONAL Harry Usher! I'm a Belizean living in Michigan, really great to see you honor Harry Usher, I deem him a friend, an ancient family friend, and a role model, all the more meaningful because he is a Belizean and from such humble beginnings. My complements to whomever wrote the article, it certainly captured one great trait that Harry has and that is perseverence...his "can do" attitude. Only thing I would have added to the article so our folks can truly appreciate the magnitude of Harry's political accomplishments...the City of London, Ontario has a population of well over 300,000 and an annual budget in excess of $700million. I'm truly proud of Harry, again more so because he is a friend and a Belizean. Linda, keep up the good work you do. Thanks Linda, this is a great story. GOOD JOB ON YOUR SPOTLIGHT OF THE MONTH LINDA. VERY INTERESTING! Because it took awhile to read, I was forced to listen to your music. Girl I enjoyed that rendition remix of Swing Low-Sweet Chariot. I was so unhappy when it stopped. It's what I needed to hear today. Thanks again and please keep up the good job you do. Drop me a message the next time you play Swing Low ok! I will appreciate it. Hope you had a very fun Valentine's Day. Love always. Wow this is good - I attended the same High School like him (Belize Tecnical College) a few decades after him. It is nice to see someone come this far. With hard work and dedication anything is possible. I could not have said it better my self in describing my friend Harry. I am a Belizean myself and have the out most pleasure to know Harry personally as a friend and Professionally. I have seen him in action in many activities which we both have taken part in the City of London. I have the out most respect for him and admire his accomplishments. I am proud to call him my friend and proud to be from the same country we love so much, Belize. "One Voice Under One Flag"
I was pleased to see the Belizean Spotlight for this month was my Uncle Harry. I made sure I read it all and shared it on my Facebook wall as well. Things like these always interest me, even more so when I know it is a fellow Belizean. I think my Uncle Harry is a wonderful role model and inspirational speaker when it comes to knowing what you want and doing what you have to do to achieve those dreams. Thanks to Ms. Hernandez for the wonderful write up she did on Uncle Harry. I thank you all for the work that you do when it comes to people, news and events concerning our homeland Belize. I know a lot of Belizeans abroad really appreciate being connected to Belize somehow by your write ups. As my Uncle Harry always says, "Have a Sensational Day"!! Greetings! I hope this finds you and all who read your wonderful material, in good health, a cheerful spirit and a positive frame of mind. I am humbly moved, honoured and grateful to have been chosen as your Belizean Spotlight for February 2011. I read the entire post and believe me, although it was about me - true is every respect - I was inspired. Thanks you very much for chosing me and thanks to Kim Hernandez who did a superb job in putting the material together. I hope God will continue to give me strength, health and energy to continue the work I do and to continue my MISSION in life "to inspire and empower individuals to better their personal disposition or quality of life." I pray also that you will continue to do the Good work that you do via this POST. It is an enormous task, but it serves a lot of people. I am proud of you and the work you do. God bless you as you too continue to be SENSATIONAL. A City of 360,000 people with an yearly Budget of over $800,000,000. Wonderfully interesting account of Harold Usher. Loved reading and learning more about this amazing friend of mine. Thanks!